You can send a direct message to users who follow you and who you are following back. You can see the list of those users at the bottom of your profile, under 'buddies' . There are two ways you can send a message to another user. You can send a direct message to another user right from the profile of that particular user. You will see a 'Send Message' button at the bottom if this user is on your buddies list (figure 1). Clicking on this button gives you a field where you can enter a message to this particular user (figure 3). Click on the green 'send' button to send the message to this user's inbox. You can create a new message from the inbox. 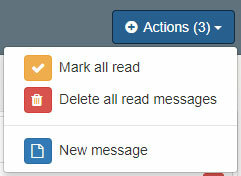 Click on the 'Actions' button at the top right and select 'New message' (figure 3). Select one of the users from the dropdown list, enter a message into the field and click on the 'Send' button to send the message to the selected user. You can see your message in the 'Sent' tab of you messages.